A member of the FBI leaves the Mandalay Bay Resort and Casino, from which Stephen Paddock shot and killed 58 people and wounded hundreds more on Oct. 1, in Las Vegas, Nevada, Oct. 4, 2017. The lawyer for the girlfriend of Las Vegas shooter Stephen Paddock said the woman had no idea Paddock was planning any violence. Marilou Danley spent much of the day Wednesday being questioned by FBI agents in Los Angeles, where she arrived from the Philippines late the day before. Danley's lawyer, Matthew Lombard, told reporters she was in the Philippines to visit family. Paddock sent her $100,000 while she was there, telling her to buy a house. Danley was worried Paddock was breaking up with her, her lawyer said, adding that Danley regarded Paddock as a "caring, quiet man." While investigators sought to unravel the mystery of what caused Paddock to kill 58 people and wound nearly 500 others, President Donald Trump was in Las Vegas, trying to console victims and meeting with police and first responders. 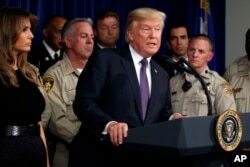 President Donald Trump speaks after meeting with first responders and private citizens who helped during the mass shooting, at the Las Vegas Metropolitan Police Department, Oct. 4, 2017, in Las Vegas. Trump, speaking next to first lady Melania Trump, praised emergency workers and medical staff who responded to the massacre. "What I saw today is just an incredible tribute to professionalism," Trump said. "It makes you proud to be an American." Bry Thompson wipes away tears at a makeshift memorial in the middle of Las Vegas Boulevard following the mass shooting in Las Vegas, Nevada, Oct. 4, 2017. 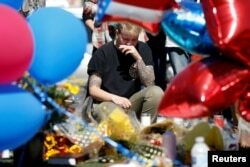 During prepared remarks at local police headquarters, in front of police officers and Nevada politicians, Trump said, "We cannot be defined by the evil that threatens us," noting that "Americans defied death and hatred with love and with courage" in selflessly coming to aid of others at peril to their own lives during the attack. The shooting happened Sunday night on the Las Vegas Strip, a popular American tourism destination. Police said Paddock, 64, from his 32nd-floor room at the Mandalay Bay Resort and Casino, fired on a crowd of 22,000 people attending a country music festival. Authorities said Paddock fatally shot himself as police moved in. "The fact that he had the type of weaponry and the amount of weaponry in that room, it was pre-planned extensively, and I'm pretty sure he evaluated everything he did in his actions, which is troublesome," Sheriff Joseph Lombardo of the Las Vegas Metropolitan Police Department told reporters Tuesday. Trump called Paddock " a sick, demented man." 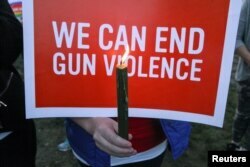 The shooting reignited a decades-old debate about guns in America. The president, when asked at a hospital about gun control, replied, "We're not going to talk about that today." Investigators found 23 guns inside Paddock's hotel room and 12 "bump stock" devices that can enable a rifle to fire continuously. The gunman also had set up multiple cameras looking into the hallway outside the room, apparently to monitor the police response. Another 26 guns were found at two of Paddock's homes in Nevada. A single rose is left at the door of the Mandalay Bay Resort and Casino in Las Vegas, Oct. 3, 2017. A gunman opened fire on an outdoor music concert on Sunday, resulting in the deadliest mass shooting in modern U.S. history. Lombardo has expressed confidence that his investigators, along with federal authorities, will determine Paddock's motivation for carrying out the worst mass shooting in modern American history.